This part of the trail is on the wall-walk. It starts by going up Victorian steps and through a Victorian tower in order to climb a flat topped hill that was made for one of William the Conqueror’s wooden “motte and bailey” castles about 950 years ago. The motte was the hill for the castle keep, the bailey was the defended space next to it. After climbing almost to the top of the motte the Walls here run on 2 sides of the bailey, built on the mounds that the Normans had wood walls on. Soon after leaving the bailey mounds the wall-walk goes over the top of an arch called Victoria Bar [in honour of the Victoria who had just become Queen when this arch was cut through the ramparts and Walls]. Oddly, the cutting through showed there had been a medieval gate here. Soon there is a sign set into the paving of the wall-walk to tell you to look slightly to your right to see the oldest church tower in York. Its tower was built of Roman stone some years before the Norman Conquest about 100metres from the ramparts which were later to carry the Walls. The outer ramparts here have the most varied wild flowers of anywhere on the ramparts. It is probable that the ramparts from now on contain the remains of the walls that the Romans built around the important civilian town that grew up across the river from their legionary fort. 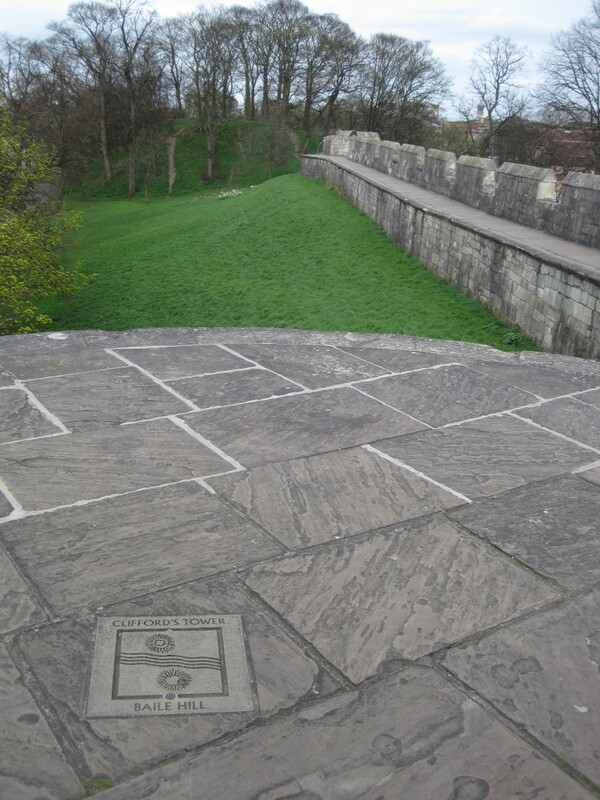 This south corner of the trail ends at Micklegate Bar. There’s an information board in the Victorian tower which the steps go through at the start of this part of the trail. This little bit of the Walls replaces a medieval wall that ran down to a tower at the river’s edge and included a postern gate and a tower to guard it. This was the first bit of wall that the corporation knocked down –it resulted in the corporation’s being successfully sued by the archbishop. 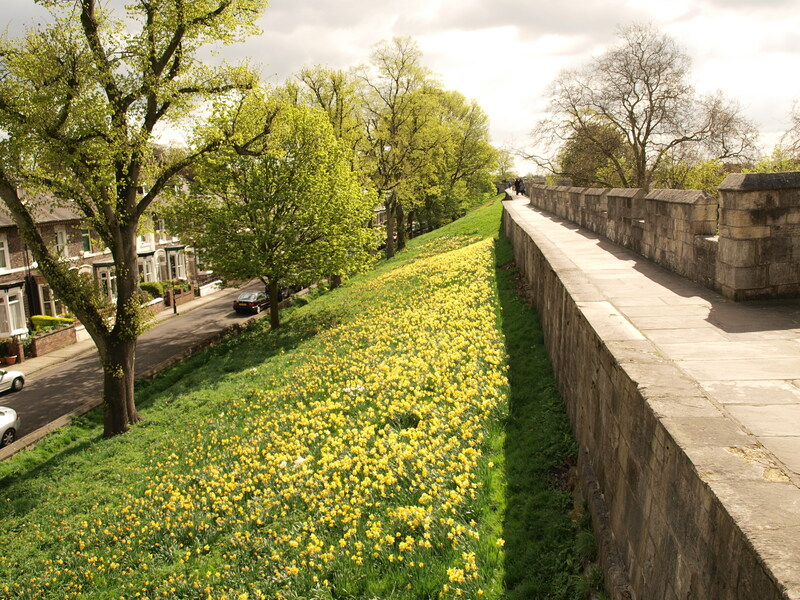 Archbishops have along history of being in charge of this area of the Walls –in the early Middle Ages they were responsible for the defence of the castle here and there were conflicts with the citizens when this was one of the last sections of the Walls not yet built in stone. 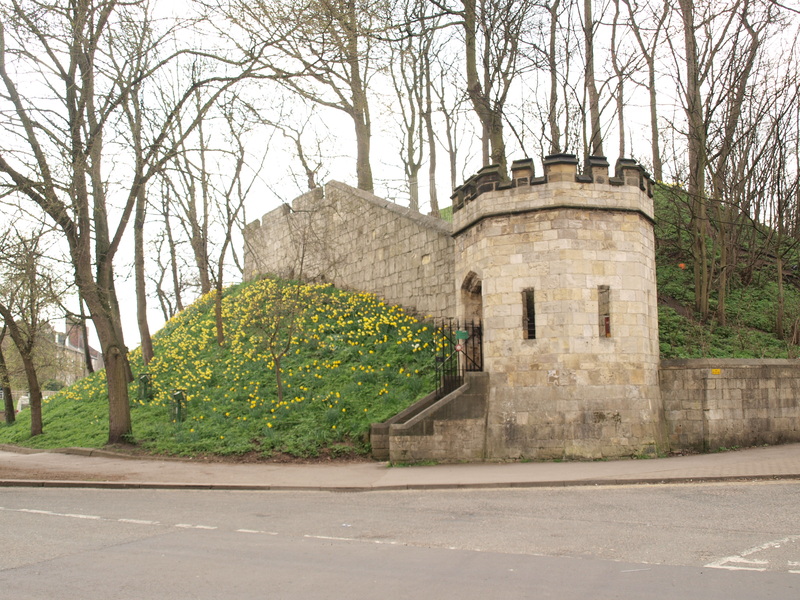 In the 1320s the danger from Scotland increased and Archbishop Melton arranged for the castle bailey’s wood walls to be replaced by stone ones. It is thought he pulled masons off their work building the Minster in order to get the work here done fast. Evidence that this happened comes from reports that the masons’ marks here seem to match some found in the Minster –the only mark I have found that can be seen from the trail is in the bottom course of stones of the parapet of the first interval tower after the steps, it is on the fourth stone from the right, it looks like a triangle with two of its sides extended at one corner. 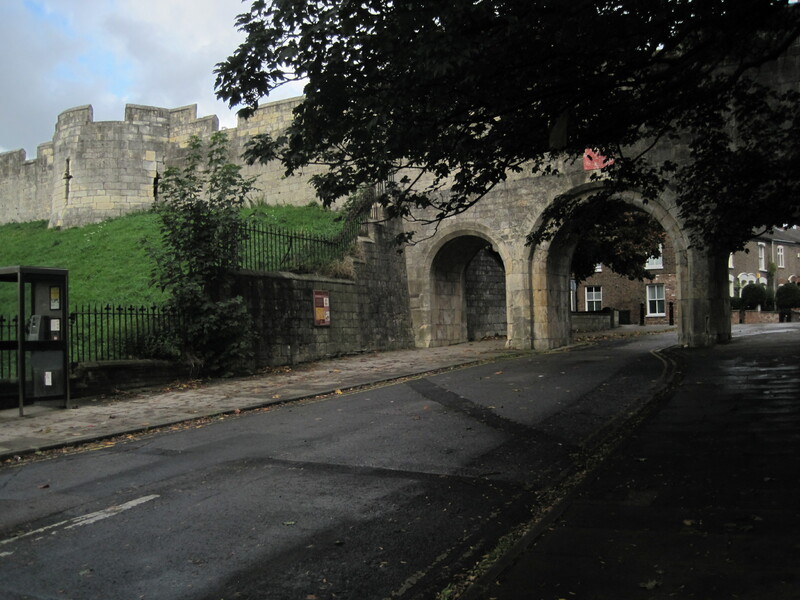 The archbishop’s experiences in the disasterous battle of Myton in 1319 [see Bootham Bar story] may have made him eager to strengthen the Walls here. The corner tower has a stylised map set into its paving, it could be a puzzle but it’s to remind you that if you look back you can see the motte [called “Baile Hill”] of one of William the Conqueror’s castles –and that the motte of the other is on the other side of the River Ouse. 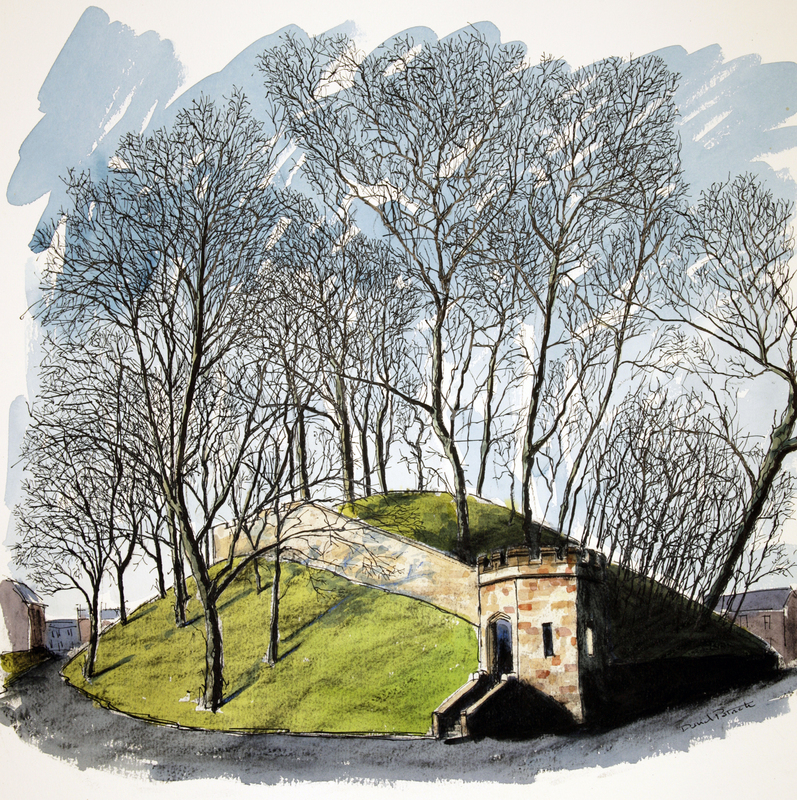 The tower on the further motte [Clifford’s Tower] is just visible from this point if the trees on the closer motte are not in full leaf. This corner tower is intriguingly called Bitchdaughter Tower, why it has this name seems a puzzle. If you look over its battlements you can see its walls splay out at the base for structural strength or to deflect heavy rocks etc. dropped on attackers. 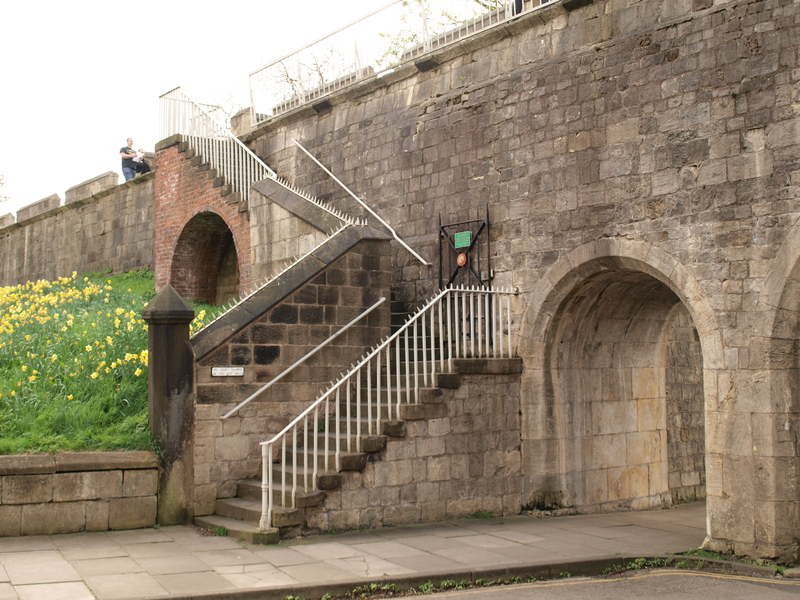 Much of its stonework may be of the Civil War period as records suggests a tower here slipped away from the Walls so had its stone taken and used for repairing York bridge in 1566. There is another small puzzle 50 metres past the next tower, it seems to be a gaming board roughly cut into the paving. On the outer ramparts there is a biggish patch of an interesting wild flower that may have been there since it was brought to York by the Romans, it is called alexanders [for more information see the appendix section on “Flowers of the Walls and Ramparts”] . 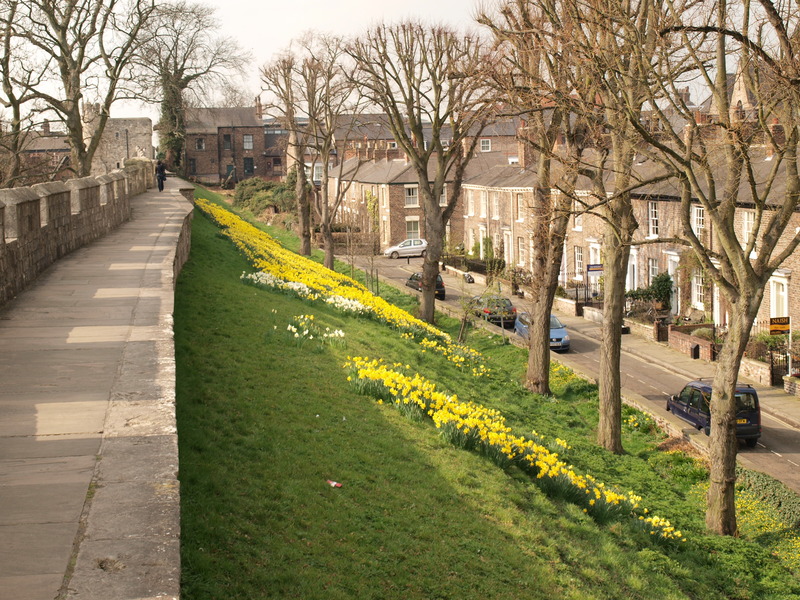 To find it, look out for a tree very close to the Walls quite a way past Victoria Bar and only about 100metres short of Micklegate Bar, then look down the outer ramparts to the base of the lowest trees in the group, the darkish green, fairly glossy leaves come up in February, it flowers yellow in spring. 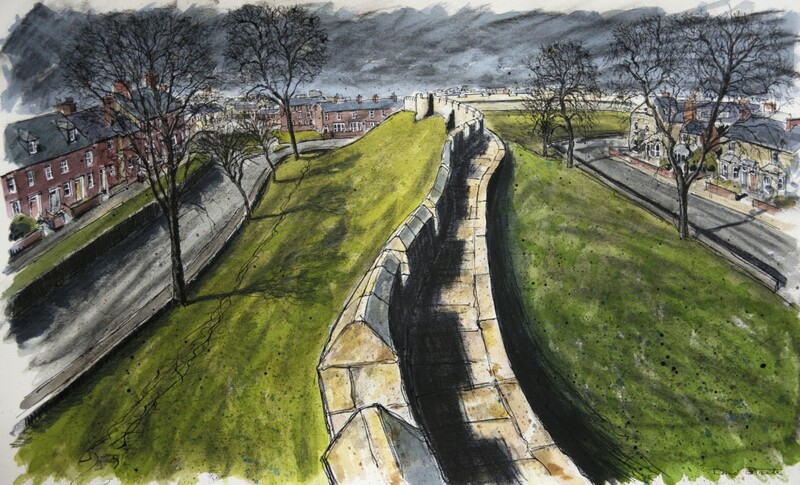 From the wall-walk above Victoria Bar [and after]: from here you have a clear but distant view of the Minster, this is at the opposite side of the walled city so you get a good impression of the size of old York [perhaps to match the impression your feet are giving you!]. To the left of the Minster and much closer to you is the tower of St Mary’s, Bishophill Junior. The spire to the right of the Minster is the medieval church of St Mary’s, Castlegate, [Castlegate, unsurprisingly, runs from the city centre to Clifford’s Tower]. Just across the road from you is a Victorian Methodist chapel, the housing just inside the Walls throughout this part is Victorian. 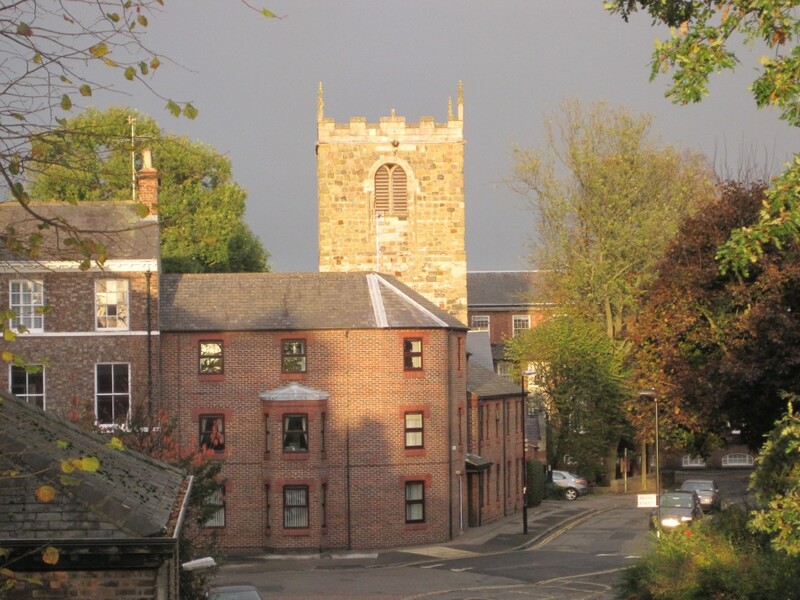 You get closer views of St Mary’s, Bishophill Junior, for about the next 150 metres –that is way past the marker for the church set into the pavement of the wall-walk at the next interval tower. This St Mary’s is, as explained in “basics”, considered the oldest church in York. From Sadler Tower just after Victoria Bar: outside the Walls, slightly to the left and almost a kilometre away you can see the clock tower of what was York’s second largest sweet factory, it was closed down shortly after Terry’s, originally a York family firm, was taken over by multi-national Krafts. 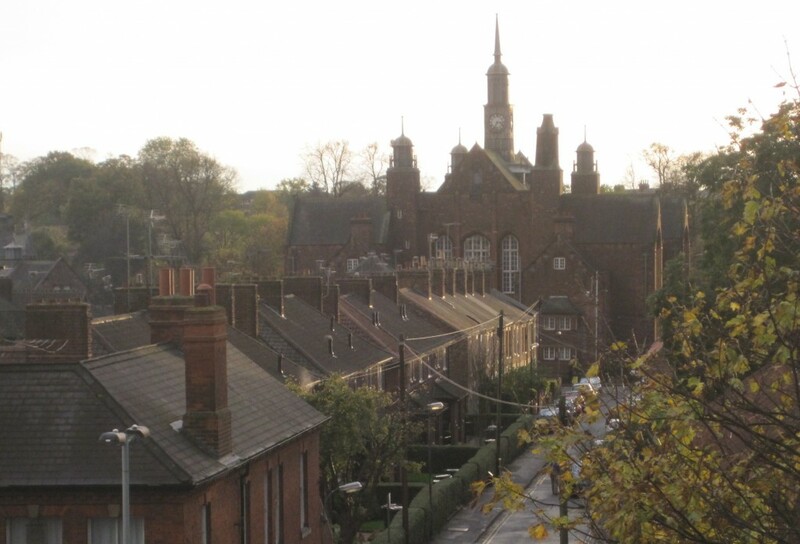 Rather closer and a little to your right is an attractive late Victorian school looking a little like a palace-castle in a Disney cartoon. It is pleasing to imagine that its architect, like Disney, wished to delight children; after all it was built when the law had just been changed to rescue those under eleven from employment and sociologists say the Victorians invented childhood, by developing the idea that children should be treated as special. Eventually you can see this palace of childhood quite well at the end of a road leading to the Walls but it is still about 200 metres away. This extra adds little except, perhaps, for some children who find walking along a paved wall-walk a bit dull. Please note that for this extra you need to judge for yourself what is safe for you and undamaging for the Walls and the old man-made hill they climb up -but I don’t think that everyone needs to avoid the following mild temptation. When you get to the top of the steps at the start of this part of the trail, it’s possible to use the end of the railings on your right to clamber down off the walls onto the upper slopes of the Norman motte. 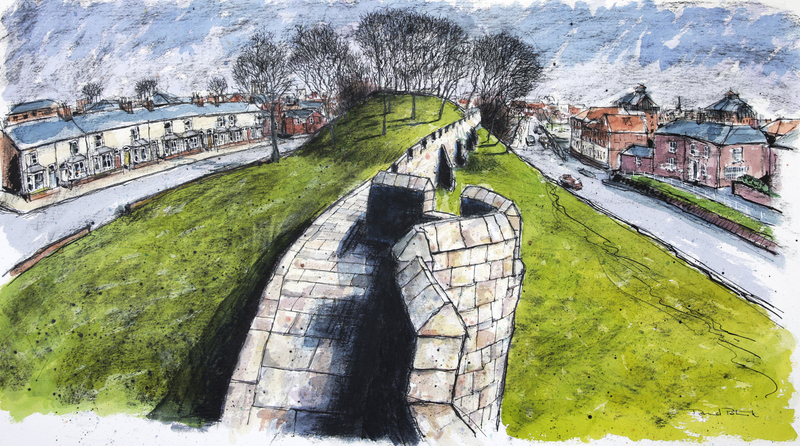 You can then walk up the slope to the flat top that once held a wooden tower to look out over the city, the river and the land around, looking for danger to York -or danger from York because the Norman conquerors were not popular with local people. Your best route back is the one you have taken to get here. There are steps down from the wall-walk at Victoria Bar so you may wish to use these to have a look at the bar at ground level. You are likely to find this a disappointment but there is an information board here about the bar and for a few hundred metres further west there is a pleasant green space beside the inner ramparts with a small children’s play-park at the end. In York’s records about its Walls there are all sorts of snippets of information –and all sorts of gaps in the information. For example there are records of the taxes that were paid at the gates of York on goods brought in to be sold in the city’s markets. In 1226 there was a charge of 1 penny for a loaded cart [a halfpenny if it was loaded in Yorkshire] and a halfpenny for each cow or horse, a halfpenny then was the daily pay for a female unskilled labourer. The Walls and bars made it fairly easy to collect this tax, some say this provided an important extra reason for having the Walls. The problem of the rivers was solved by having chains slung across the river –a loaded boat was charged four pennies to enter York. These taxes were called “murage” because they were meant to be spent on the Walls, meant to be spent by the “muremaster” whose unpaid job it was to inspect the Walls and arrange for necessary repairs; we have some records of the people who were elected to be muremasters. Historians think they have evidence that few willingly stood for election so first it was made something you had to have done if you wanted to become Lord Mayor and then the work was handed over to someone with a marvellous job title, “the Common Husband” [currently it’s done by the CYC Asset Engineer]. There are also old records that mention a gateway called Lounelith –but then all mention of this gateway ceases. Lounelith is said to mean “secluded gate”, I like to think of it as “the lonely gate”. Sadly, if a gate is lonely it is not going to have many people pressing to have it kept in good repair and if a muremaster should think that repairs [and the pay of the gatekeeper] are going to cost more than the murage collected at that little-used gate then he’ll want it closed up rather than repaired. Whether this is what happened or whether the Lord Mayor and wardens decided they wanted fewer gates to guard at some time of danger we will probably never know. 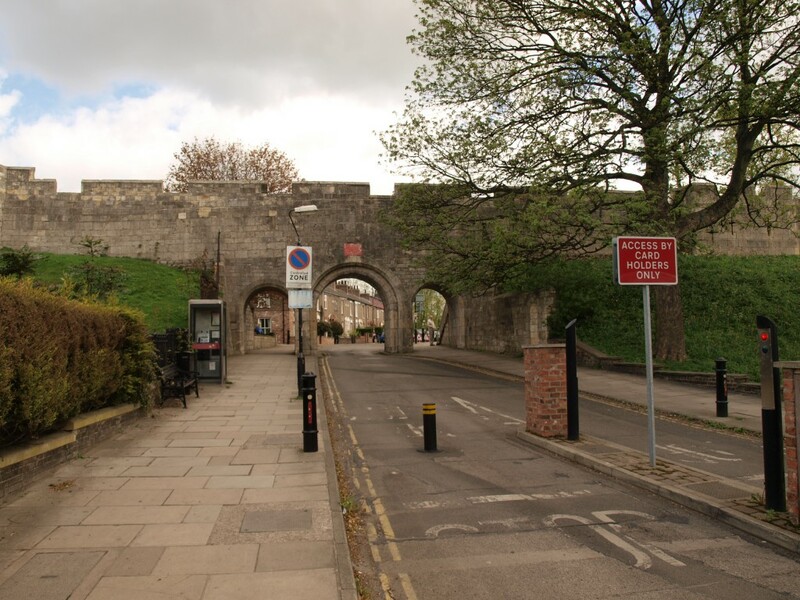 It was thought that we’d never even know where the lonely gate was but then in 1838 a busy businessman became Lord Mayor of York [George Hudson, for more about him see section 12’s story “The Railway King”]. He organised a collection to finance the building of a new gate through the Walls; he thought this would be a busy gate because there was new housing both inside and outside the Walls at the point where he wanted the gate. The collection was successful, the Walls were dismantled at the chosen place and the ramparts dug away for the building of the new arch and then a strange discovery was made: the ramparts were not just medieval wall foundations, earth and Roman wall, they seemed to contain an old gateway blocked with large stones laid on edge so as to fill the gateway as thinly and quickly as possible. Historians think that the lonely gate had been found, though the new gateway on its site was named Victoria Bar, after the new Queen. I don’t know if it became for a while a popular and far-from-lonely gate but now it is again a rather quiet, secluded and, perhaps, lonely gate.